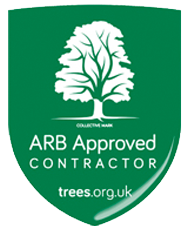 Are you an Arboricultural Association Approved Contractor? Yes. We achieved this status several years ago and are re-assessed regularly. Therefore we can guarantee that we will meet the highest standards in tree care. Do you hold the professional tree inspection LANTRA Award? Yes. Martin Saxon (Director) & and the team leaders all have passed this exam and attained this highly recognised award. Are Apex employees qualified for the tasks they carry out? Yes. All of our staff are highly qualified in tree surgery and have NPTC and LANTRA qualifications for the tasks they carry out. Do you provide free advice? Yes. We are always happy to talk about trees and discuss our clients' requirements free of charge. 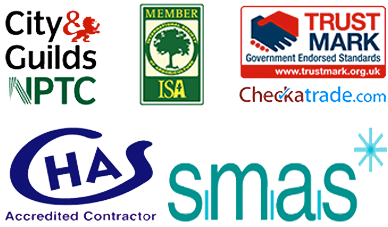 Do you provide a free, no obligation written quotation? Yes. We have always done this. This way the clients know exactly what we will be doing and what the cost will be. Will you deal with the Local Planning Authority on my behalf? Yes. We have good working knowledge of planning with regard to trees. We deal with local planning authorities on a regular basis. Will you make a Tree Work Application on my behalf for free? Yes. Our applications are professionally produced-they are typed and include colour photography where needed. If we are employed to carry out the tree works granted, we will waive any fee for the application. If you just want to use us to apply to the council on your behalf and not to carry out the tree works, we would also be happy to do this but this will be chargeable work. Do you carry out a bird nesting survey before carrying out tree work? Yes. We have a duty to make sure that our work does not adversely impact on the environment or wildlife. In most cases this would not be a concern and it’s unlikely this would hinder tree work operations. Do you protect my lawn/plants from being damaged? Yes. Where needed, we place clean boarding on lawns and plastic sheeting over shrub beds to protect them. Do you leave my garden clean and tidy? Yes. This is a very important part of our work-we can guarantee to leave your garden as we found it. Will you still be able to help us if we have already had tree work refused by the Council? Yes. We can. By looking at what you have applied for and what the reasons for refusal were. We examine the case, and using our experience along with further negotiation, we will work hard to help you with the desired works. This sometimes would result in the appeal process. This can be on a no win no fee basis. Can you help, our garden is in shade and we would like more light into it? Yes. Even removing dead branches from a tree will allow more light to penetrate through a tree’s crown but in most cases reduction and thinning can be the best way to achieve this. Can you help, we are losing our views? Yes. There are many different types of tree work operations that can improve views. Reducing the tree or crown raising can be very effective ways of achieving this. Even if trees are protected works are often allowed with the correct application. Do you take the stress out of the whole process, and will you deal with everything on our behalf? Yes. Whatever needs to be done, we will try our best to do it- without you having to worry about it. Can you take pictures of all the trees and show me exactly what works are proposed for my clarification? Yes. This is called “photographic interpretation”. It’s something that we have been doing for several years and it shows our customers exactly what to expect from our quote. This prevents any ambiguity about the details of the works.